This about us page is a little different than most, we've stayed away from the traditional corporate style, in favour of being more relaxed. So gone are the suits and ties! Auto Access Japan Ltd. is a medium size family run company (although the kids don't do much yet!) exporting quality Japanese used cars all over the world. We turn over between USD5-10 million per year and run an office in Adachi-ku, Tokyo, strategically located to access the various Auctions in and around Tokyo. 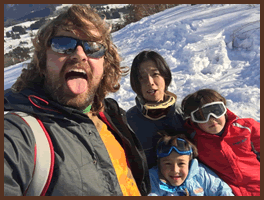 I'm Stuart McKean, an Australian that moved to Tokyo with the entire family in 2010. 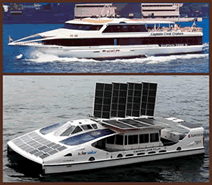 I have an extensive mechanical background as well as backgrounds in the commercial vessels, business and government. With the guidance and support of my lovely wife Aki, who has worked in government administration for a number of years, we established this company to seek out the best Japan has to offer in used cars. I did quite a number of years working for the NSW Government in Australia as a Boating Safety Officer. Pictured here on the beautiful Clarence River, situated on the far north coast of NSW, onboard the Tug/Pilot vessel the Frances Freeburn. Most of the time, however, was spent on the patrol boat ensuring the safety of all waterways users. As a result I gain extensive mechanical experience during this time. Going back where it all started was as an apprentice Avionics Ground Engineer for an airline operating the Fokker F27 and F28 aircraft. Throughout the whole period, though, my love has always been for cars...and now with the culmination of experiences across all those different fields, we are in a great position to offer our clients second to none service and the best quality Japanese used cars Japan has to offer. Here's a picture of my first rebuilt when I was an apprentice. 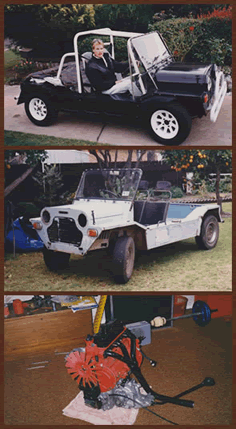 The Moke is a great car and this one ended up with a polished head, extractors, twin SU carbs, blue printed and totally rewired. The engine was reassembled on the bedroom floor...much to my mothers disgust! Thanks again for your interest in Auto Access Japan and we look forward working with you. 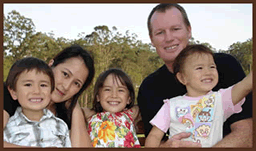 My name is Peter Scully and I grew up in the northern tablelands of NSW. Funnily enough, for a country as big as Australia, only a couple of hours from where Stu grew up. I’ve been in Japan for more than 9 years now. The first time being in 2001 when I came here on a working holiday (teaching English) and that’s when I met my wife, Rieko. We worked at the same company in Tokyo, married in 2005 and moved to Australia the following year. When we first moved to Australia, we took 4 months to drive around most of it so Rieko could have a good introduction to the place. After that, we lived in a number of different areas and I worked in a few jobs including Mine Exploration, Underground Mining, Train Driver and High School Teacher. Both of our kids, who seem to enjoy coming up with new ways to keep us busy, were born in Australia (2008 & 2010) but we decided to move back to Japan in 2012. We enjoy travelling around Japan experiencing the different scenery, culture and food unique to the different places. It’s very safe to live here, which is definitely something I’ve come to appreciate since having those 2 energetic kids! Stu and I have known each other for about 10 years now after our wives (both Japanese) met while Stu was working on the water in Northern NSW. He and Aki started this company in 2010 and has seen it grow so much in that time. It has grown so much that, in 2015, he asked me if I would join him. I’ve loved every minute since (even the wet, snowy, cold, energy sapping hot ones!). I’ve been interested in cars since I was old enough to drive and am enjoying helping others find their perfect car. There are so many more kinds of cars in Japan than in Australia and I seem to learn something new every day, which means there’s never a dull moment! We believe we are offering a really important service to those interested in buying a car from Japan, either for personal use or as an investment. The effort we put into getting that perfect match for our clients, is reflected in the number of repeat and referred clients we have (check out the testimonials if you haven’t already). I look forward to helping you find the car that’s right for you from the Japanese auto auctions. David is my brother-in-law and his IT expertise has help shaped the way we do business. Dave runs his own company in Australia, specialising in web design and database programming. He can even design a freestanding PC database application that interacts with your online presence.